When Simon Smith and Melissa Davidson signed up as Red Cross emergency volunteers, they knew they’d learn new skills, gain experience and help their community. They didn’t know they’d also find love. Red Cross Disaster Welfare and Support Team (DWST) members Melissa and Simon ready to respond in 1988. Eighteen-year-old student Melissa was an avid surf lifesaver, looking for another way to give back to her community. Simon, 20, worked for National Bank. He was also keen to help people, but didn’t decide to join Red Cross until he saw a display of emergency vehicles at an air show. “I joined because I wanted to help people. I also think I wanted to play with the toys – Red Cross had pretty cool Land Rovers at that point,” he says. 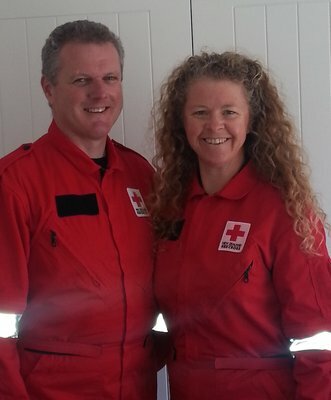 Simon and Melissa both attended their first Red Cross training in Auckland on 10 February, 1987. It was the first time they’d met. Three years later, the pair were married. More than quarter of a century down the track, Simon and Melissa are still married and are still part of Red Cross. These days, the pair are part of Red Cross’ Christchurch Disaster Welfare and Support Team (DWST), with Simon the team’s leader. Red Cross DWST volunteers provide support during disasters, delivering first aid, carrying out reconnaissance and operating welfare support centres. Teams, located all over New Zealand, undertake regular training and exercises to prepare. It can be a big commitment, especially with teenage children and pet dogs to plan around, but the pair feels it’s worth it to be able to help in their community. Simon and Melissa in their modern Red Cross gear. During their time with Red Cross, Simon and Melissa have helped people during floods, as well as through more serious events. The biggest response they’ve attended was Cyclone Bola. When the storm swept across the North Island in 1988, it destroyed roads and bridges, caused widespread flooding and even created mudslides. Simon walked out of his job to join the Red Cross response – his employer kindly took him back when he returned a week later. Melissa was studying when the cyclone hit. Long before mobile phones, the university receptionist took the call from Red Cross and interrupted Melissa’s physics lecture to tell her the news. “She came in and called me out. I threw a bag on the back of my motorbike and left a note for my mother – ‘gone to Cyclone Bola’ – and didn’t return for two weeks!” Melissa remembers. These days, Simon, Melissa and the team are ready to respond at a moment’s notice, recently helping out after Cyclone Gita swept across New Zealand, and the couple is encouraging others to get involved with Red Cross. “It’s a really nice way of giving back to the community. It’s useful, it’s practical and there’s a need for it. We have a bit of fun at the same time,” Melissa says. If you’re keen to learn new skills and help when it’s needed most, join your local Red Cross Disaster Welfare and Support Team. Find out more and sign up.